Volume indicators are used to determine investors' interest in the market. High volume, especially near important market levels, suggests a possible start of a new trend, while low volume suggests traders uncertainty and/or no interest in a particular market. Volume indeed cannot be calculated based on the number of contracts traded and the size of those contracts since Forex market is decentralized by its nature. Volume is calculated based on price ticks. 1 tick is 1 volume. As price changes back and forth, volume adds up. High volume will have lots of such simple tick shifts, while low volume - very little. I've been trading in stocks for the past 7 years using only price, volume and OBV and it has worked very well for me. My question is,will this type of analysis also work in Forex? Yes, it will. Forex uses the same technical approach for analysing volume. There is an important volume index that doesn t appear in the list: the market facilitation index. I use it for the last year at to me, it is the best volume indicator in the market, since it takes into account not only the pips fluctation accumulation but also the intensity of the variation of each movement of each movement of the cursor price. Combined with a couple other indicators to measure the trend and the momentum and then you have a very stable trading system. Thank you, the indicator has been added. I've looked everywhere for the Chaikin Money Flow Indicator and can't find anything! First time I've failed to find what I was looking for. Do you have the indicators for Renko and Point & Figure charts? What is the best indicator for detecting pivot points? Renko indicators are currently being prepared. Can't guarantee the date. Point and figure I don't have, sorry. Is there a volume indicator that will give me buy/sell information? I realize that the volume indicator is based on tick information, but is there up verses down tick information available? Custom written indicators are capable of providing buy/sell signals, if that's what you mean. Sorry, I don't have such Volume indicators in my collection. Can you please also add VWAP (volume weighted avarage price)? yes, thank you. Added to the list, but will have to study it first myself. 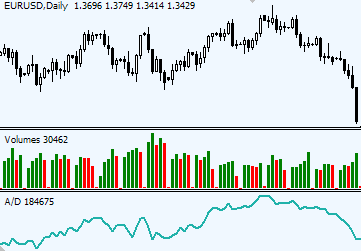 To display simple Volume indicator in MT4 use Ctrl+L or right mouse click anywhere on the chart and select "Volumes". Bearish/Bullish volume indicators? No, don't have information on those, sorry. What are the best indicators for commodity reading ? Looking for Swing Volume indicator. AKA Weis Wave, but he charges $500 for the indicator. Can't afford it right now.